As the exodus of taxpayers from the Empire State continued during the past decade, which other states gained the most at New York’s expense? And how were migration patterns affected by changing economic conditions? Between 2000 and 2009, nearly 60 percent of the New York out-migrants moved to southern states—with Florida alone drawing nearly one-third of the total. Thirty percent moved to New Jersey, Pennsylvania and Connecticut. Migration slowed after real estate values peaked in 2006 and dropped very sharply after the recession began in 2007. Florida accounted for 35 percent of New York’s net migration loss in 2005—but by 2009, its share had dropped to 11 percent. That year, for the first time on record, New York lost more residents to North Carolinathan to Florida. Taxpayers who left New York State had average incomes 22 percent higher than those moving into New York in the most recent year for which data are available. The IRS records the movement of taxpayers and their dependents, based on year-to-year changes in the addresses shown on individual tax returns. While this excludes persons who don’t file tax returns in the year before or after they move, it measures about 90 percent of migration counted by the U.S. Census. 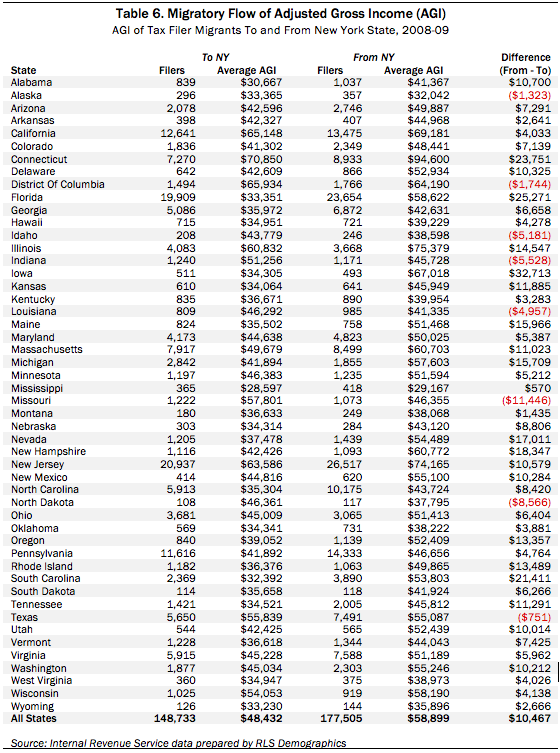 As shown in Table 1, nearly 1.2 million taxpayers and their dependents moved from New York to other states between 2000 and 2009. Florida was the most common destination, followed by New Jersey, Pennsylvania and North Carolina, in that order. However, as the economy slowed in the second half of the decade, so did migration. The drop in net moves from New York to Florida was especially large. 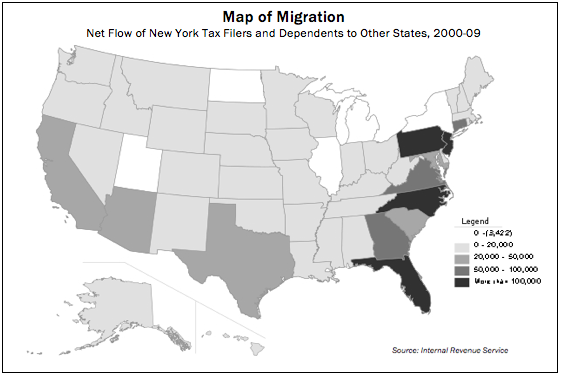 In 2005, with migration at its peak, the IRS data indicated New York lost nearly four residents to Florida for every Floridian who moved in the reverse direction. Four years later, in the depths of a recession that was especially severe in the Sunshine State, the number of New Yorkers moving to Florida had dropped by more than half (from 85,619 to 41,371). Meanwhile, the number of Floridians moving to New York increased by 45 percent (from 23,019 to 33,345), reducing the outmigration ratio to 1.24 out-migrants for every in-migrant. By 2009, New York’s net migration loss to North Carolina was larger than its loss to Florida for the first time on record. 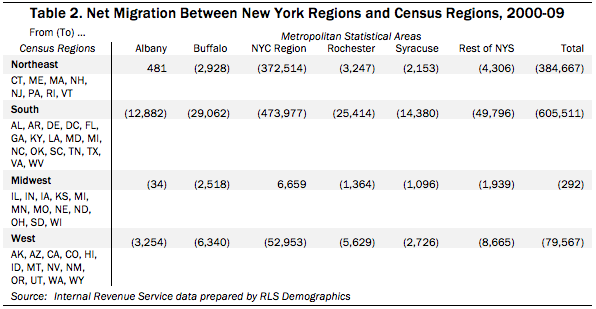 As shown in Table 2, the migration pattern to other states was not uniform among different New York regions. While just over half the net migration flow from the New York City metropolitan region was headed South, nearly 40 percent of the taxpayers lost by that region moved to other states in the northeast, mainly neighboring New Jersey, Pennsylvania and Connecticut. The net migration flow from upstate regions overwhelmingly favored the South and West, with fewer headed to New York’s neighbors. This tendency was most pronounced in the Albany region, which lost taxpayers almost entirely to the South and West. 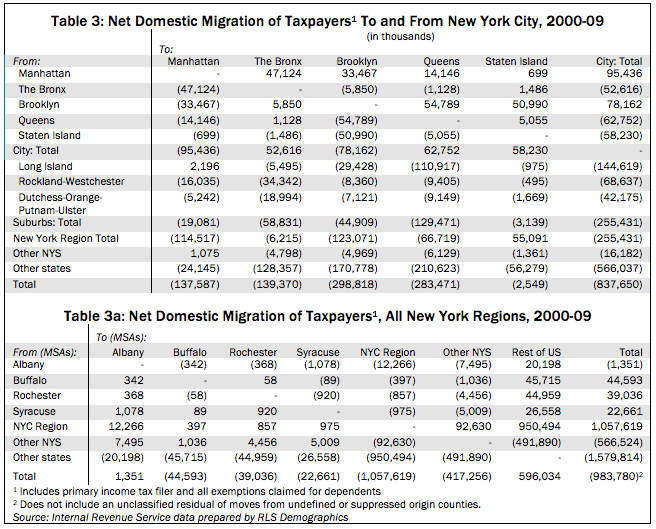 As detailed in Table 3, the migration of taxpayers and their dependents within New York City reflects long-standing population flows from Manhattan to outer boroughs, from Brooklyn to Staten Island, and from all five boroughs—especially Queens—to suburban counties. Roughly 94 percent of the intrastate New York taxpayer-migrants from New York City stayed within the region, moving to either Long Island or the lower Hudson Valley. New York City also lost a net 16,182 taxpayer-migrants to upstate New York regions, and 566,037 taxpayer-migrants to other states. The New York City region as a whole, including the suburban counties, lost 92,630 taxpayers and their dependents to upstate New York, which in turn lost 491,890 taxpayer-migrants to the rest of the country. The region-by-region breakdown is shown in Table 3a. The IRS data also provide adjusted gross incomes for migrating individuals and households in the year they move. Measured on this basis, migrants from New York had incomes about $3.3 billion higher than migrants to New York in 2009, down from a peak of $5.3 billion for migrants in 2005. 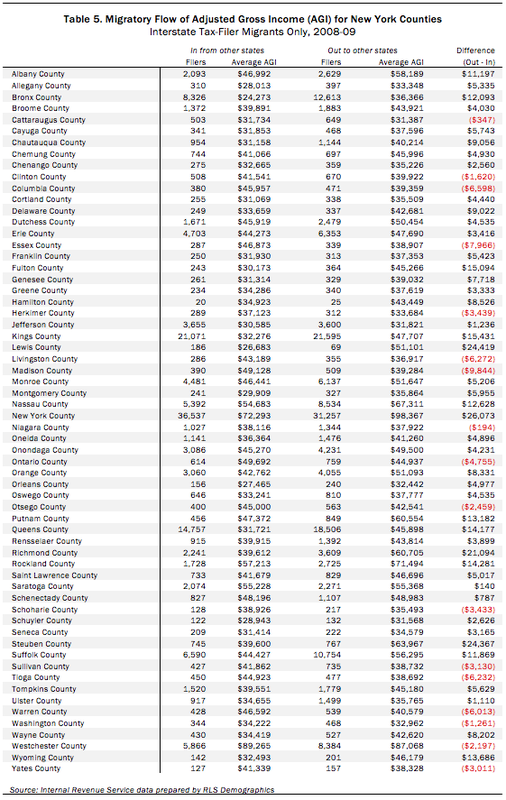 As shown in Table 4, below, New York’s annual net income losses from 2000 through 2009 totaled nearly $37 billion. Incomes change over time, so this does not necessarily mean New York was $37 billion worse off at the end of the period than it would have been if no moves had occurred during this period. At the very least, however, the average incomes of migrating taxpayers reflect New York’s ongoing loss of earning power – and, in many cases, job skills — to other states. From 2001 to 2009, New York State’s greatest annual net income losses, like its greatest population losses, were to Florida and New Jersey, in that order. But Connecticut, the sixth most popular destination state for net migration of individual New Yorkers, ranked third in its net income gain from New York. Conversely, Pennsylvania ranks third in the number of people gained at New York’s expense, but fifth in its net income gain from migrating New Yorkers. The average adjusted gross income of taxpaying households leaving New York between 2008 and 2009 was $58,899, while the average income of households moving into New York was $48,432—a difference of 22 percent. Non-migrating New York households as of 2009 had an average income of $63,630. A county-by-county breakdown of average incomes for interstate migrants to and from New York is presented in Table 5 on page 7. As shown, in 16 of New York’s 62 counties, the average income differential was the reverse of the statewide average; i.e., in these counties, the average incomes of in-migrants from other states were roughly equivalent to or exceeded the average incomes of out-migrants to other states. Higher or roughly equivalent in-migrant incomes were concentrated in less populous, rural upstate counties. The average income differentials for out-migrants matched or exceeded the statewide average in New York City, Long Island and the lower Hudson Valley suburbs, as well as in all of the most urbanized and populous upstate counties (except for Onondaga County, which includes Syracuse). The largest differential in absolute terms was in New York County (the borough of Manhattan), where the average out-migrant income of $98,637 was 36 percent higher than the in-migrant average of $72,293. The percentage differentials between out-migrants and in-migrants were even higher in the rest of the city. 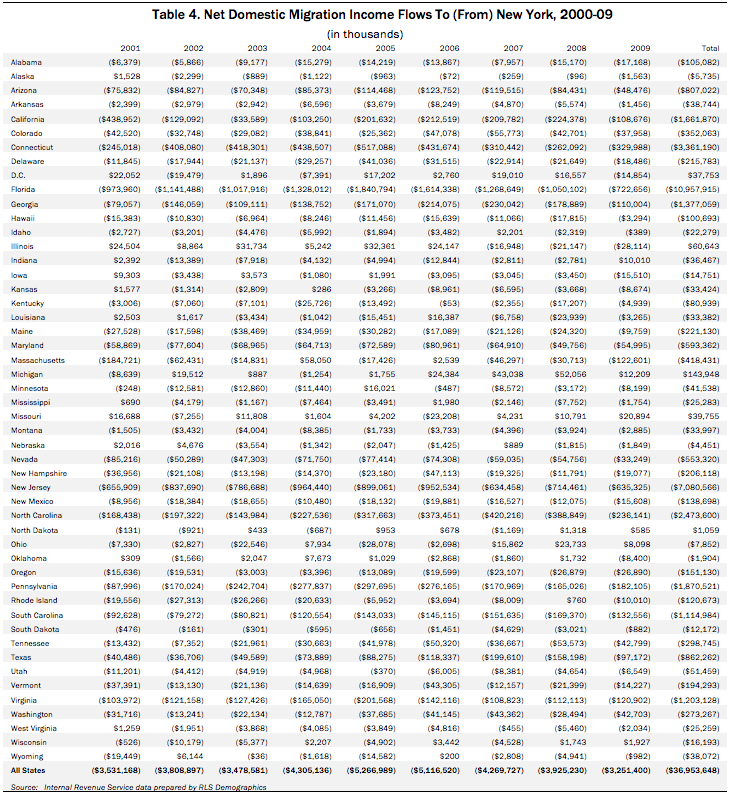 Turning to a state-level comparison, as detailed in Table 6 on page 8, migrants from New York had higher average incomes than migrants to New York in 42 out of 50 states between 2008 and 2009. New Yorkers migrating to New Jersey, the most common destination state, had incomes $10,579 higher than the smaller number making the reverse move. The differential was $23,751 among New York migrants to and from Connecticut, which also attracted the most affluent New Yorkers, on average. The average income data for migrants to and from New York reflect the same pattern as the aggregate income and population data: southeastern states, and neighboring Connecticut and New Jersey, have been the biggest net beneficiaries of the Empire State’s losses—which can be traced largely to the New York City metropolitan region. 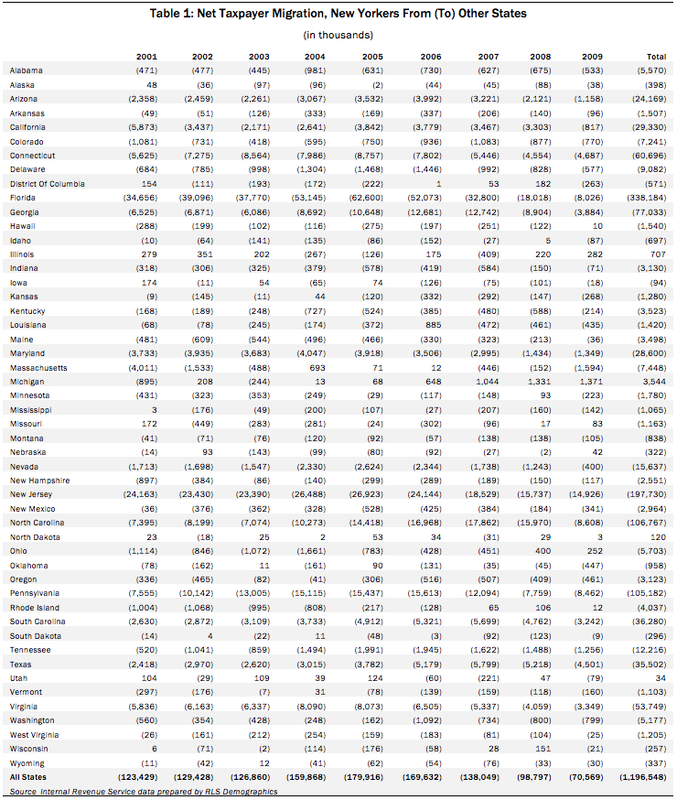 As detailed in Table 6 on page 8, the IRS data show that 177,505 federal tax returns were filed by former New Yorkers who had moved to other states in 2009, and 148,733 returns were filed by households that moved into New York from other states that year. 1. E.J. 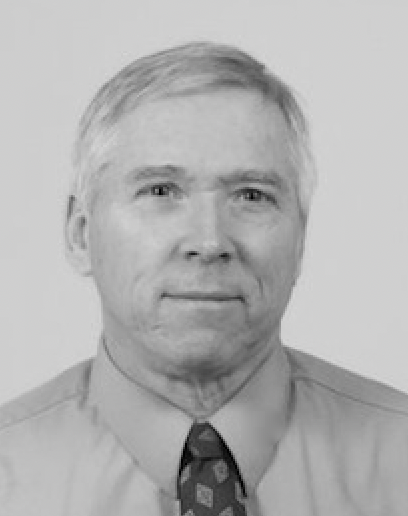 McMahon and Robert Scardamalia, “Empire State’s Half-Century Exodus: A Population Migration Overview,” Empire Center Research Bulletin, No. 6.1, August 2011. Migration slowed after real estate values peaked in 2006 & dropped very sharply after the recession.